An 8-year-old Durham boy remains in the hospital suffering from critical injuries from a wreck that could have been avoided. DURHAM, NC (WTVD) -- Durham Police are warning drivers to prevent train accidents by not stopping on the train tracks while waiting for a traffic light to turn green. On Tuesday, an 8-year-old Durham boy remains in the hospital suffering from critical injuries from a wreck that could have been avoided. Police say the child's father was stopped at a traffic light on the railroad tracks when the railroad's train alert arms came down around the vehicle. The accident happened Monday evening at the intersection of Driver and Pettigrew streets. The boy and his 2-year-old sister were sitting in the back seat of their dad's truck when a Charlotte-bound Amtrak train from New York hit the vehicle's passenger side. 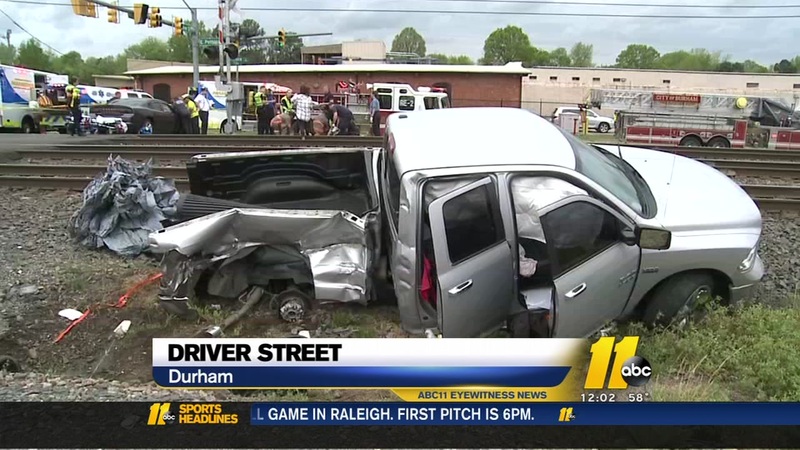 Three people were injured Monday evening when a train collided with a pickup truck near the intersection of Driver Street and Pettigrew Street, according to Durham police. "We really could feel a jolt," said Sue Roth, who was on the train. She and the other 140 passengers on board were not injured. The driver of the truck was also not harmed. His 2-year-old daughter is described as stable at Duke Hospital. The toddler was strapped in a car seat. Her older brother was not. "Our prayers are with the family and hopefully the little boy pulls through," Roth said. The injured child attends Club Boulevard Elementary School, and on Tuesday, the school's principal reached out to his family to offer support. These are the total vehicle vs. train crash numbers since 2016. According to the State Department of Transportation, Monday's crash brings the total number to two crashes so far this year in Durham. And just one in Wake County. The last time there was a train crash at the intersection of Driver and Pettigrew Streets was 11 years ago. Durham Police say accidents like this can be prevented if drivers avoid stopping on the train tracks. The crash is still under investigation by Amtrak and police.